I was watching the recent Voice of America Kunleng discussion on contemporary Tibetan writing, with guests Tenzing Rigdol (artist, poet) and Dhondup Tashi Rekjong (editor, writer). There was talk about Rigdol’s recent book of poetry and talk about Bhuchung D Sonam’s recent book of criticism, and discussion on the urgent need for criticism and the huge gaping whole there, where our small community is concerned. Of his own book, Rigdol said, “If a book isn’t reviewed, it becomes an orphan.” So this is…not an adoption exactly. I am hardly a real reviewer. This is more like a care package. Tenzing Rigdol follows in the tradition of the sixth Dalai Lama Tsangyang Gyatso, Tibet’s most beloved poet, with this slim volume of love poetry. By devoting an entire collection of poems to romantic love, he elevates this most secular of emotions and assigns it a sacredness usually offered only to the Dharma in our society. One the whole, I found Butterfly’s Wings to be beautiful and powerful and inventive in some places and clumsy and clunky in others. An imperfect but exciting and noteworthy collection nonetheless, it makes me thrilled to continue to watch Tenzing Rigdol’s evolution as a poet. The first thing you notice about Butterfly’s Wings is how beautifully it is produced. 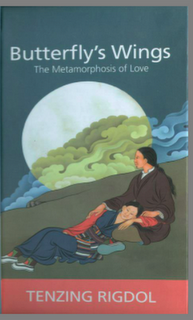 The cover art, a serene and lovely image of a young Tibetan couple enjoying a quiet moment of intimacy on a moonlit night, is by Tenzin Norbu, an artist from Dolpo. As a physical product of the collaboration between Rigdol, the publisher TibetWrites and the filmmaker Tenzin Tsetan Choklay who did the book design, this is a rebuke to the indifferent book covers churned out by most Tibetan publishers. The best poems in the collection are the most restrained and the most simple. Smooth, round, blunt and abrupt. Only my silence befits your adornment. But unfortunately this restraint and simplicity are not as present throughout the collection. Indeed, rather than restraint, I found an excess—an excess, mainly, of adjectives, particularly Latinate ones. Rigdol doesn’t trust his nouns to do any heavy lifting; where he has a noun, he must use an elaborate adjective. Why insist on telling us that the tears are “briny” and the smell “pungent”? Presumably, everyone expects tears to be salty and smells to be smelly. Not all nouns need ornamentation. Too many adjectives overload the poem, like too much make-up on a woman. In a poem, real estate is precious. As Rigdol himself tells us in his best poems, a single extra word is a hindering crowd, or simply, a crowd. How little is said in the first sentence and how much in the second! I also thought some of the poems could have been refined further. How lovely and apt that image of the throat as a wineglass receiving the captured wine is, but why the tonally off “dark nasal tunnel”? Like a wrong note, it jars my enjoyment of the poem. And dare I ask, how is the nose “forgotten” when it is breathing in the aroma? And don’t the line breaks, as they are, distort the shape of the poem rather than enhance it? A poem is a creature for the ear, of course, but my eye cannot help nosing in. As with the wineglass image, at his best, Rigdol can create gorgeous lines with bright and sharp metaphors and similes: he says, “I lay shrunk like a frozen shrimp” (Pg 73) and likens love to “a wind-carried pollen looking for its soil-mate.” How inventive and unexpected and fun that “soil-mate” is. And where the adjective does earn its place (“my decanted mind”! ), there is music to be found. Rigdol is a very well-known contemporary Tibetan artist whose Soil Project, the site specific installation for which he smuggled soil from Shigatse, Tibet and brought to Dharamsala, the capital of Tibet-in-exile, made international headlines. In some ways, we can see this book as a site specific artwork as well, with the site being the female body, specifically the body of the beloved. If this book is the result of Tenzing Rigdol’s surrender, I think we can conclude that it was a fruitful surrender. I like the cover of the book. It is very artistic and I wish I had it for the cover of my book because it is exactly the type of painting I was looking for to adorn my book. I will have to contact the artist and collaborate with him. Thank you for your review. It was well balanced. Please feel free to share any information on your book and thank you for your comment.